Last Updated: February 6, 2017 By Katie 14 Comments -- Paid Promotion. Disclosure policy here. 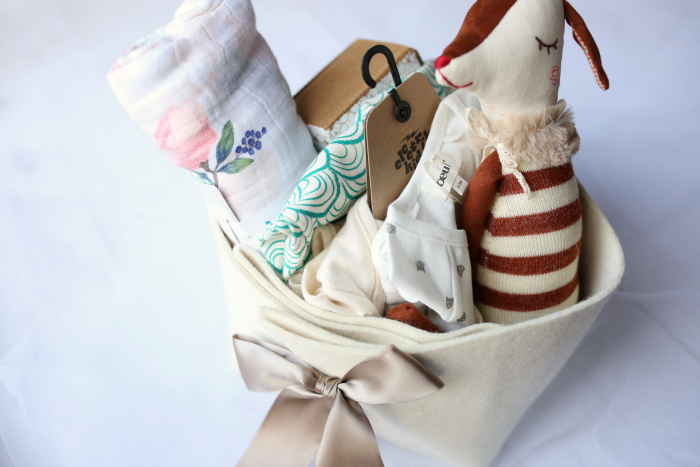 Have you heard of Bonjour Baby Baskets? If you’re looking for a really nice gift idea for a new mom, it’s the perfect place. I love the idea of being able to create a basket and fill it with whatever you find on the site! RELATED: create a baby registry on Amazon for up to 15% off baby products. Bonjour Baby Baskets has pre-made baskets full of fun goodies for babies, and also has the option of creating your own basket, which is what I did. You just choose your basket and then fill it with whatever you like. It’s not only super cute and personable, but also really fun. 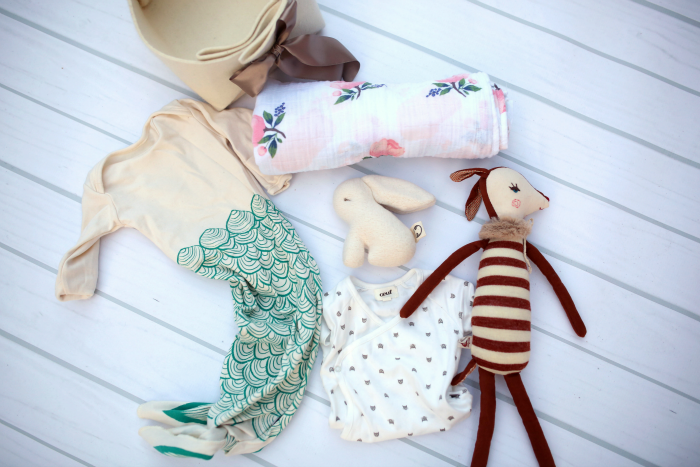 They have luxurious brands with quality baby items, like this gorgeous rose swaddle from Little Unicorn that I’d had my eye on for some time, and Maileg stuffed animals- this deer is just the cutest! What I really like about them is that they are so unique. 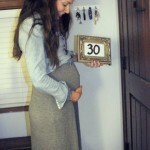 Most of the items they have, you just don’t find on regular registries or in big-box stores. 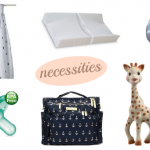 The products are a welcome change from the standard selection of baby products on the market today and are perfect for the expecting mom who seems to already have everything. Check them out and let me know what you would put in your basket. This is great! 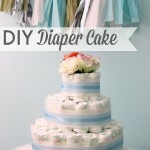 I would give this to any mother not just a mother of a newborn! I’m checking this out. Totally- it’s perfect for any mom!! This is such a great idea! A family friend just had a baby and this is the perfect gift! And that mermaid gown is so freakin adorable!!! Major heart eyes, over here. LOVE!! Your little mermaid is just adorable!! Thank you so much, Susana!! :) We LOVE our basket of goodies! Your little mermaid girl is the cutest!! 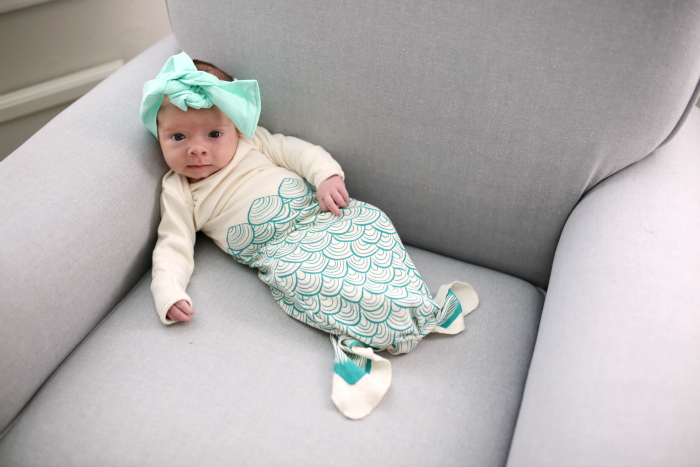 I’m dying over that mermaid onesie! So cute! Little mermaid girl…..cuteness can not be contained! Too perfect! omg. Sophie the mermaid is quite possibly the cutest ever!